I learned to clean fish when I was nine-years old, taught by my father, practicing on the sunnies, perch and bass my brothers and I caught in rural Michigan. Cleaning fish is a tripartite affair–scraping the scales off while grasping a slippery tail, gutting and removing the viscera, and cutting out the gills and fins, preferably without spearing yourself on any of the dorsal spines. The process, conducted with a Cub Scout jackknife over several sheets of the Kalamazoo Gazette spread on the cement floor of the basement, was serious business. Rolling up the gory newspaper was always accompanied by a sense of relief and I suppose it was my first introduction to the inherent tension that accompanies the process of eating something that was once alive when you don’t get to skip any of the steps between life and death. 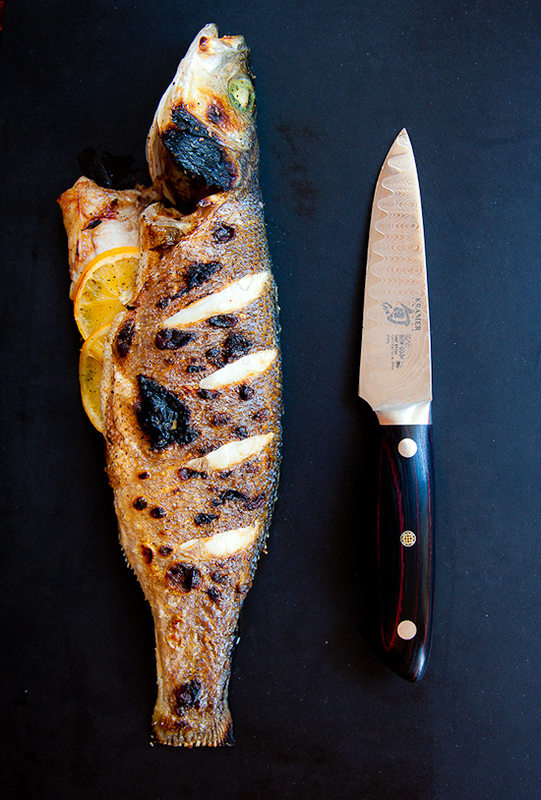 Your fishmonger will do all of this for you. But why bother, you may ask, when I can just buy fish already fileted? In a word, flavor. Fish cooked on the bone has an undeniable layer of robust tastiness that simple filets do not, in the same way the meat cooked on the bone tastes richer, meatier. 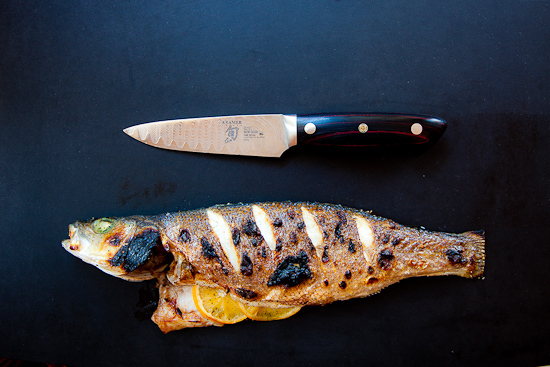 Branzino, red snapper, mackerel, bluefish, trout, char, small salmon and even chub all work well, although different fish will have different degrees of boniness. Trout, for example, has a lot of fine pin bones, even after the boning procedure I photograph below. They’re not a problem if you know to look for them. Chub is even bonier, but the bones are bigger. 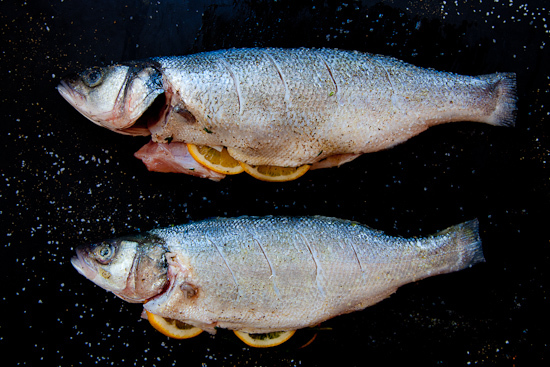 On the other hand, chub, which used to be considered a trash fish, is one of the tastiest pieces of seafood going when roasted on the bone. And if the fish is big enough you can introduce yourself to a new cook’s delicacy–fish cheeks, the piscean equivalent of chicken oysters. But I don’t like seeing the head and the eyes, and all that business with boning. This produces very generous portions of fish for 2 people, but it could probably be stretched to serve 3 or even 4 if there were lots of sides. 2 whole 1-pound fish (e.g. branzino, red snapper, mackerel, trout, arctic char), cleaned, scaled, gills and fins removed. Rinsed and dried. Preheat oven to broil. Set the oven rack on the second level below the flame. Season the inside and outside of the fish with salt and pepper. Cut the lemon in half. 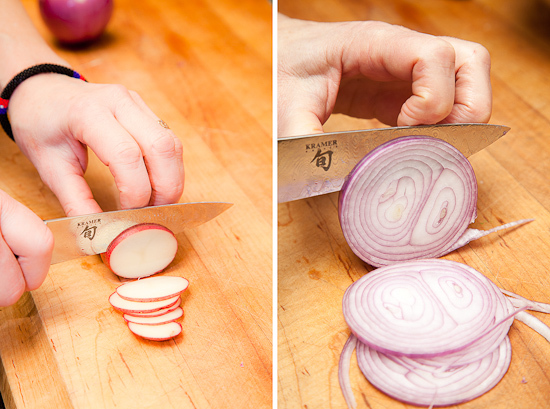 Cut one half into 6 slices, ⅛- and ¼-inch thick. Cut the second half in half again and reserve to serve with the cooked fish. Put three lemon slices, with a thyme sprig and a bay leaf into the cavity of each fish. Set the fish in front of you with the head to the left and the cavity opening closest to you. 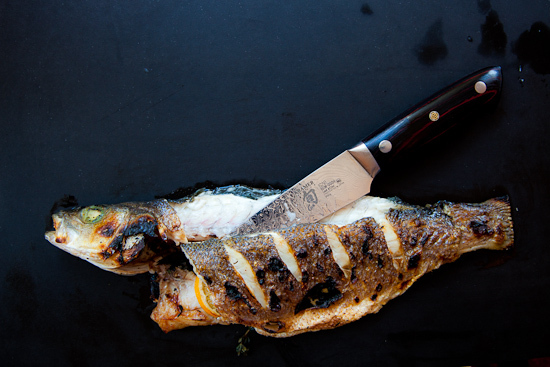 Make diagonal slashes across the fish about ½-inch deep and 1½ inches apart on the top side only. This will help the fish cook more evenly. Brush both sides generously with oil. Put a baking rack into a baking pan and brush with oil. Set the fish on the rack, with the slashes facing up. Run the pan lengthwise under the broiler for 3 minutes, turn 180 degrees and cook another 3-4 minutes or until brown, bubbly and cooked through. Remove from the oven and allow to rest while you cook the potatoes. If the fish has plenty of color but it isn’t cooked through, turn off the oven and let it rest in the oven to finish cooking. Move the oven rack to the top level below the flame. 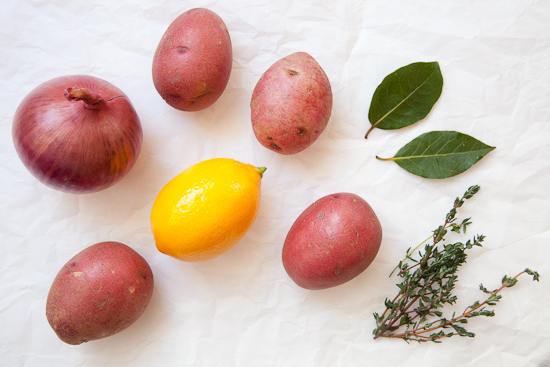 Toss the potatoes and onions in a bowl with salt and pepper and 2 tablespoons olive oil. 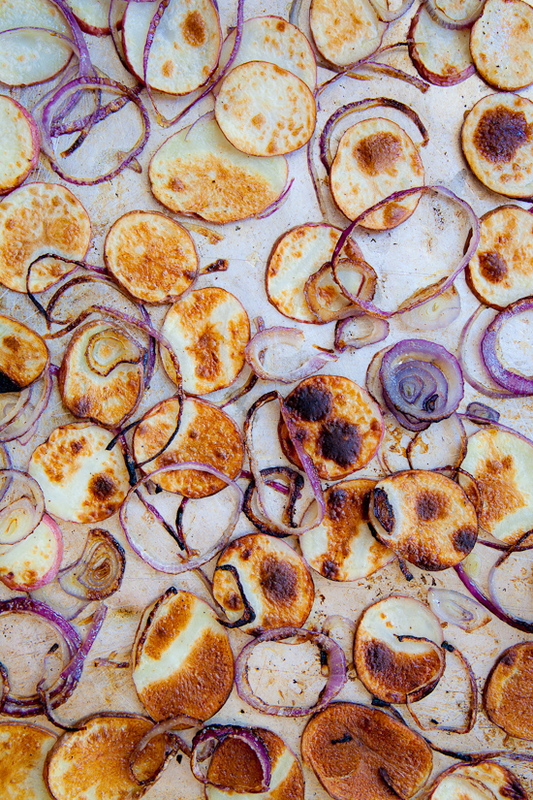 Spread out on a baking sheet. Be sure the potatoes are in one layer. They can over lap the onions a bit but not each other. Broil 4 to 5 minutes, giving them a quarter turn every minute so they cook evenly. They should be golden brown and tender. 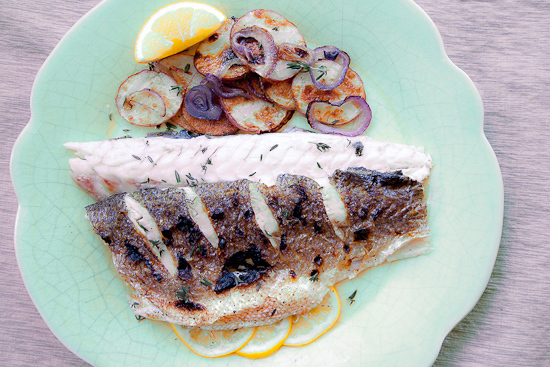 Serve the fish whole surrounded by potatoes garnished with some fresh thyme leaves and a wedge of lemon. As an alternative–I didn’t say wimpy alternative, did I?–filet the fish for your guests and serve the fillets instead. You can follow along with Ken’s photos below. Slide the edge of a knife along the dorsal (top) ridge and pull away the remains of the top fin. Do the same for the ventral (belly) fin. Scrape away any remanats of the gills. Make two cuts (marked by yellow tape): cut through the fish near the tail; cut just down to the spine behind the head, leaving the head attached. 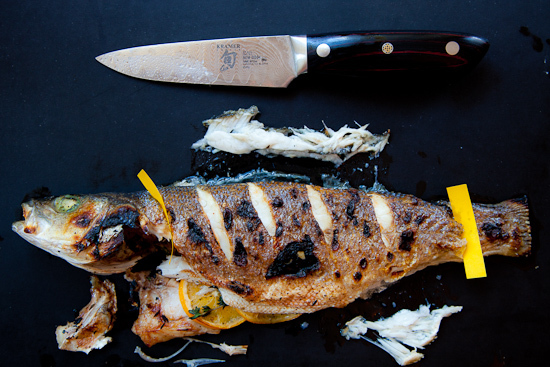 Use the knife to lift off the top side of the fish. You shouldn’t have to do any cutting. The fish should come away from the bone easily. Lift the spine (starting at the tail end) away from the bottom half of the fish. The fish frame (spine and head) should come away easily. Check the bottom half of the fish for any obvious remaining bones. Put the bottom piece of fish on a plate. Overlap the top portion so half the bottom piece is exposed. Add potatoes and a lemon. Eating a whole fish on your plate is less complicated, as long as you have an empty side plate. 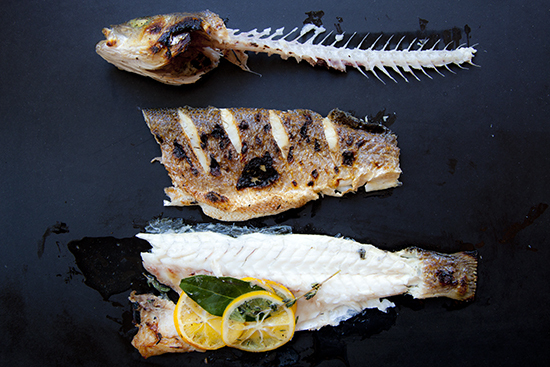 Remove the remainders of the fins and gills, then simply eat the top portion of the fish. When the spine is exposed, remove it to the side plate, along with any bones from the bottom piece of fish, then eat the bottom half. 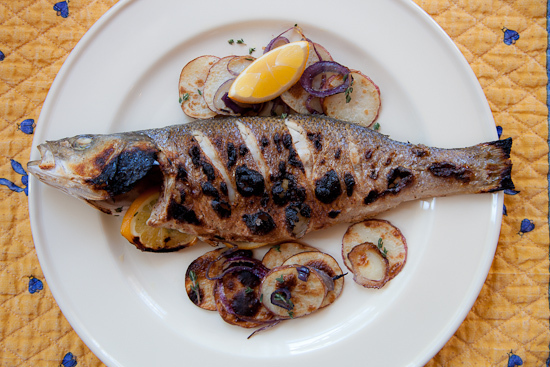 A few weeks ago a famous writer was in our restaurant and was thrilled to discover that we had a whole roasted fish on the menu. She loved the flavors, which included lemon grass, ginger, cilantro, cumin and chilis, but she was even more excited about the tasty eyeballs. Now that’s a compliment for a chef and the sign of a committed seafood lover. 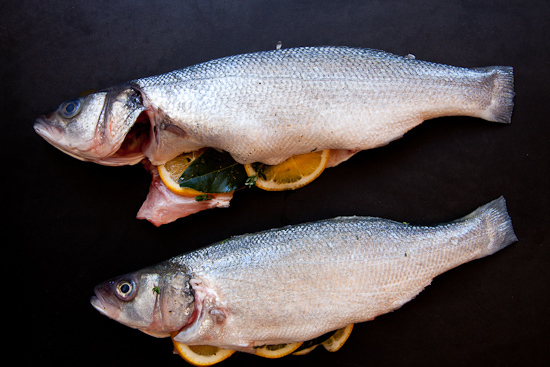 We love serving whole fish, but people often ask us to remove the head–they can’t stand having their dinner staring at them. 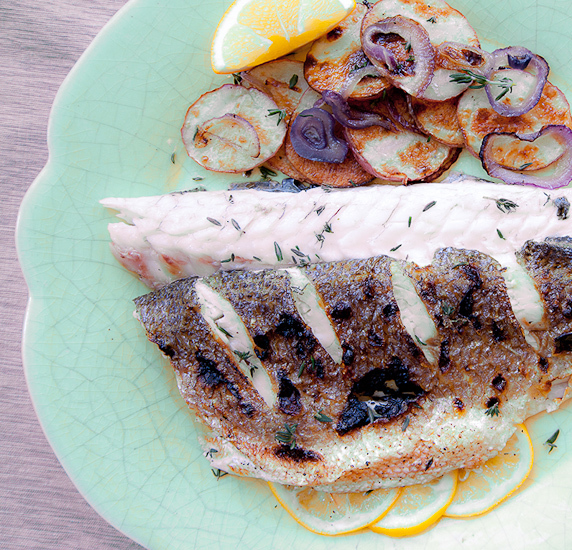 Roasting fish a little lemon and a few herbs is the perfect recipe for people who get nervous about cooking fish. It’s so easy. And if you don’t want to serve whole fish feel free to use a thick filet. Simply score the skin, season the filet all over with salt and pepper and then rub with oil and cook it skin-side-up until done. In the summer I’d add tomatoes to the broiled vegetables and perhaps some capers or olives. This is just the beginning. This entry was posted in Easy, Entree, Gluten-free, Seafood and tagged branzino, broiled, fish, simple roased whole fish, whole. Bookmark the permalink. Roasted, or is it broiled? So timely! A friend and I were talking about roasting a whole branzino just last week and I went out to my herb patch to cut her a sprig or two of rosemary. Unbelievable. The plant has made it so far through this mild winter, and if I’m not jinxing it right now, I’m guessing it will survive through the spring; an all-time first. 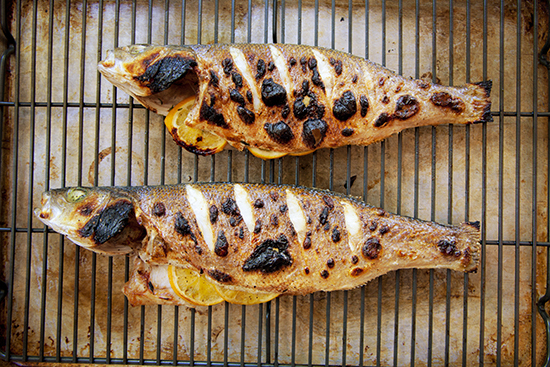 This post is the final push to get my hands on some fish and try your broiling method. I like the potatoes, too. Fast and easy, yeah! Good god that looks delicious! Going to TRADE on Wednesday—hope there’s a fish special. (On an aesthetic note: I’m not wild about the bold italic font in the blog—it’s a bit cartoony. Can you use just italic?). This begs the question (which I don’t expect you to answer), are you planning another book? I like recipes accompanied by stories, such as this one and Jody’s reminiscences of road tripping from Texas with her family. There’s something that feels very grown-up and full-circle about the combination. Sounds very much like the dinner I ate @ Eataly in Manhattan!! was the BEST!! Look forward to making it soon!! Looks yummy. And the taters and onions, too. Think we could do this with a small catfish from a clean river? Finally, it’s up! Looks so delish. And I meant to have asked, is that knife Japanese? Are you free the rest of the year…I need you to come over and feed my family…..They would love to experience GREAT FOOD!! Beautiful photo. I totally agree with you, fish is much tastier on the bone, we are lucky enough to get a lot of our fish straight from the sea living by the beach so often cook it whole. My husband made this for me one weekend and it turned out superbly! He used tilapia, because that was the only whole fish we could find in our local market. What I can’t figure out is our bay leaves: they’re long and relatively slender, and very strong though I’ve had the bottle for years. They’re so strong they had an almost turpentine-like pungence. Is this a different variety? Anyway, we had a good laugh and enjoyed our dinner. I was very impressed with how quick and easy this was! I love fish (its in my shunde blood) and as weird and freaky as it may sound, I loveee eating the cheeks and the eye balls (^^,) They the best part! The brains too actually….ok I dont want freak anyone out here, but its true, try it maybe?